This webpage provides answers for the Genesis Bible study daily questions on chapter nine. We pray that God will provide you with revelation of his will for your life as you study His Holy Word. 2. Why did God speak of an accounting for the shedding of man’s blood in verses 5 and 6? 3. What do verses 5 and 6 teach us about God? What do they teach us about His view of human life? 4. How does a reading of verse 6 affect your perspective of capital punishment? Your answer goes here because only you can answer this question. 5. What was the covenant God established with Noah? What was the sign of the covenant? 6. With whom did God make the covenant besides Noah? 7. God told Noah that He would now establish His covenant. 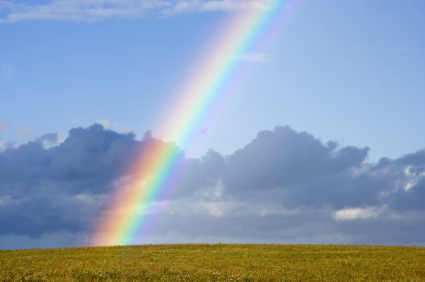 How long had it been since God had told Noah that He will establish His covenant? Noah’s sons were already born, so it was after he was 500 years old, and he had not built the ark yet Chapter 6, vs 18: But I will establish my covenant with you, and you will enter the ark--you and your sons and your wife and your sons' wives with you. Flood had not happened yet, flood occurred when Noah was 600 years old Chapter 7 vs 6 Noah was six hundred years old when the floodwaters came on the earth. The amount of time was roughly the amount of time it took to build the ark plus the time Noah spent in the ark, so it would seem the amount of time between the time when God made Noah the promise and when He established the covenant was about 101 years. 8. What is the meaning of a covenant? 9. What covenant did Jesus Christ establish between Himself and all believers at the Last Supper? 10. Are the other covenants provided in Genesis (Genesis 3:14-19; Genesis 12:1-7, 13:15; 17:7-8) still in effect today? 11. When Noah woke up, what did he prophesy would be the results of Ham’s actions from verses 24-27? 12. Why did Ham tell his brothers about his father’s nakedness? Why was it wrong and what should he have done instead? 13. Is it a sin to drink alcoholic beverages? What about becoming drunk as a result of drinking alcohol as Noah was? It is possible that no one had ever made wine yet before and that Noah had become drunk because he did not know that wine would have such an effect on man. 17 He who loves pleasure will become poor; whoever loves wine and oil will never be rich. 20 Do not join those who drink too much wine or gorge themselves on meat, 21 for drunkards and gluttons become poor, and drowsiness clothes them in rags. 29 Who has woe? Who has sorrow? Who has strife? Who has complaints? Who has needless bruises? Who has bloodshot eyes? 30 Those who linger over wine, who go to sample bowls of mixed wine. 31 Do not gaze at wine when it is red, when it sparkles in the cup, when it goes down smoothly! 32 In the end it bites like a snake and poisons like a viper. 33 Your eyes will see strange sights and your mind imagine confusing things. 34 You will be like one sleeping on the high seas, lying on top of the rigging. 35 "They hit me," you will say, "but I'm not hurt! They beat me, but I don't feel it! When will I wake up so I can find another drink?" 4 "See, he is puffed up; his desires are not upright-but the righteous will live by his faith- 5 indeed, wine betrays him; he is arrogant and never at rest. Because he is as greedy as the grave and like death is never satisfied, he gathers to himself all the nations and takes captive all the peoples. 14 He makes grass grow for the cattle, and plants for man to cultivate--bringing forth food from the earth: 15 wine that gladdens the heart of man, oil to make his face shine, and bread that sustains his heart. 7 And these also stagger from wine and reel from beer: Priests and prophets stagger from beer and are befuddled with wine; they reel from beer, they stagger when seeing visions, they stumble when rendering decisions. 8 All the tables are covered with vomit and there is not a spot without filth. 4 But you, brothers, are not in darkness so that this day should surprise you like a thief. 5 You are all sons of the light and sons of the day. We do not belong to the night or to the darkness. 6 So then, let us not be like others, who are asleep, but let us be alert and self-controlled. 7 For those who sleep, sleep at night, and those who get drunk, get drunk at night. 8 But since we belong to the day, let us be self-controlled, putting on faith and love as a breastplate, and the hope of salvation as a helmet. 2 As a result, he does not live the rest of his earthly life for evil human desires, but rather for the will of God. 3 For you have spent enough time in the past doing what pagans choose to do-living in debauchery, lust, drunkenness, orgies, carousing and detestable idolatry. Drinking alcoholic beverages in itself is not a sin; however drunkness - the result of inappropriate consumption - is clearly a sin.